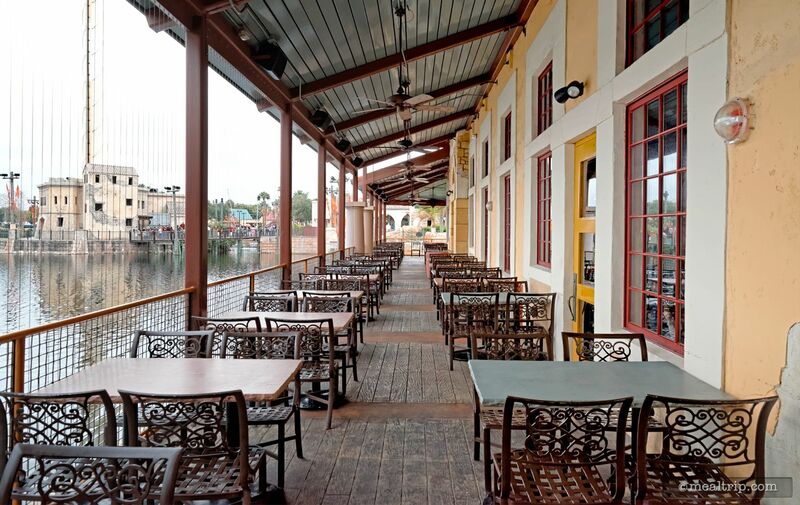 The Spice Mill features a large, indoor, air conditioned dining area with great waterfront views along with some outdoor, covered patio seating areas as well. 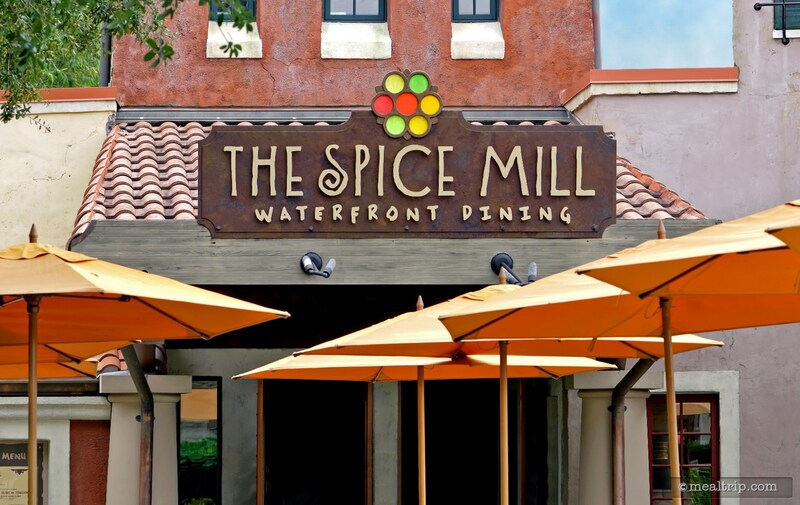 The Spice Mill uses a signature seasoning on many of it’s menu items, including a house made Low Fat Vegetable Chili, the Spice Mill Club, and a cold Chicken Flatbread platter. 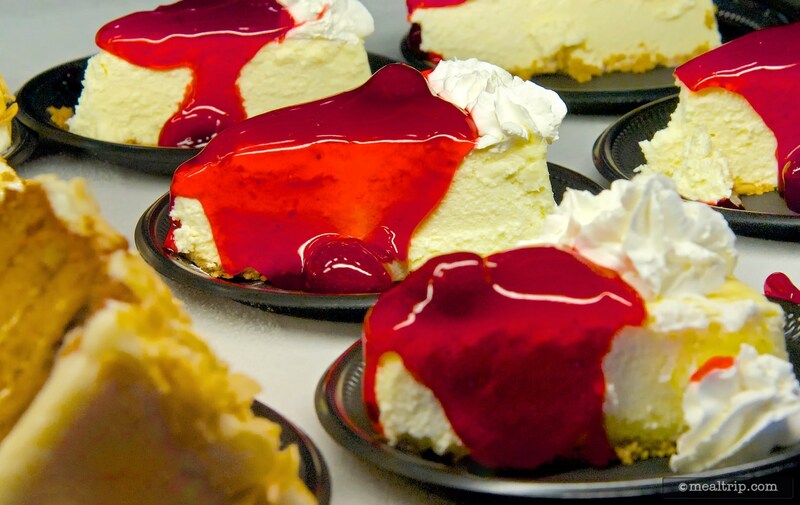 Assorted sides and desserts are available along with premium and domestic beers and wines by the glass or bottle. 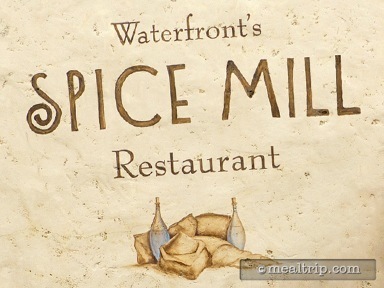 The Spice Mill Restaurant in SeaWorld, Orlando is one of those rare fast-food locations that I enjoy visiting. 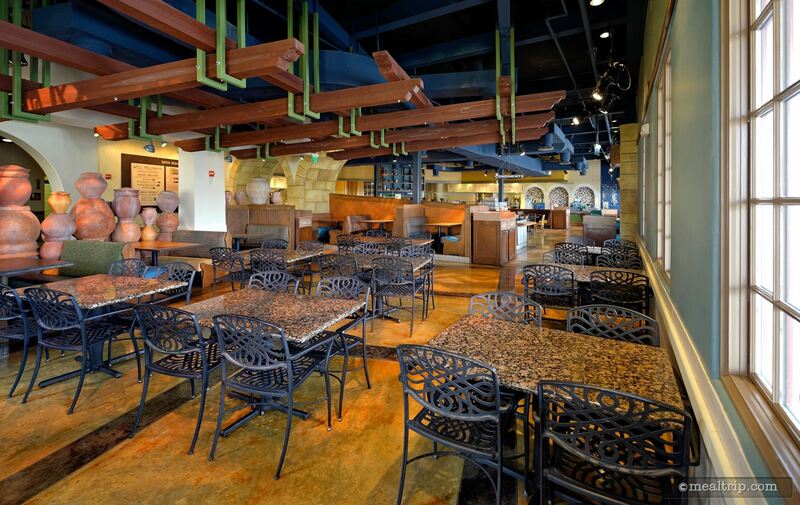 The food is good, but what I really like most is the designer's decision to paint the ceiling a dark blue and make the floors a faux coppered marble. I've never seen another interior quite like this one. It shouldn't work, but it does. 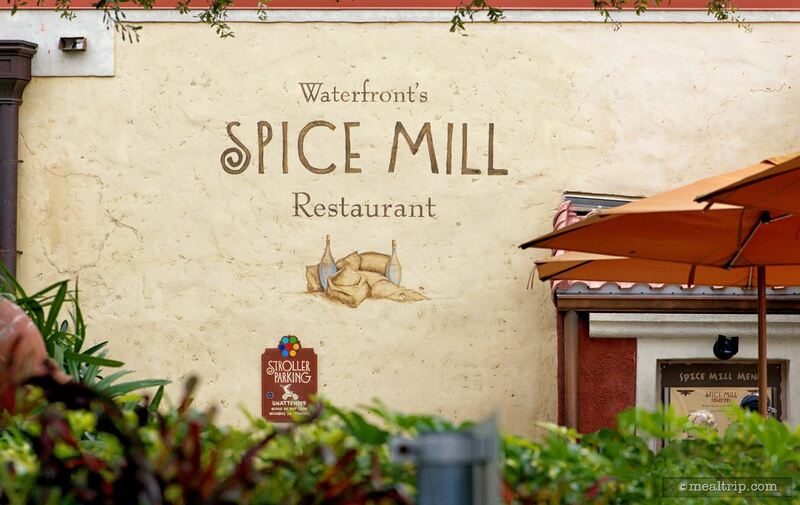 From a service and speed standpoint, this visit to the Spice Mill was like most others… slow. It seems that both checkout registers and food pick-up lines are only opened at peak periods. 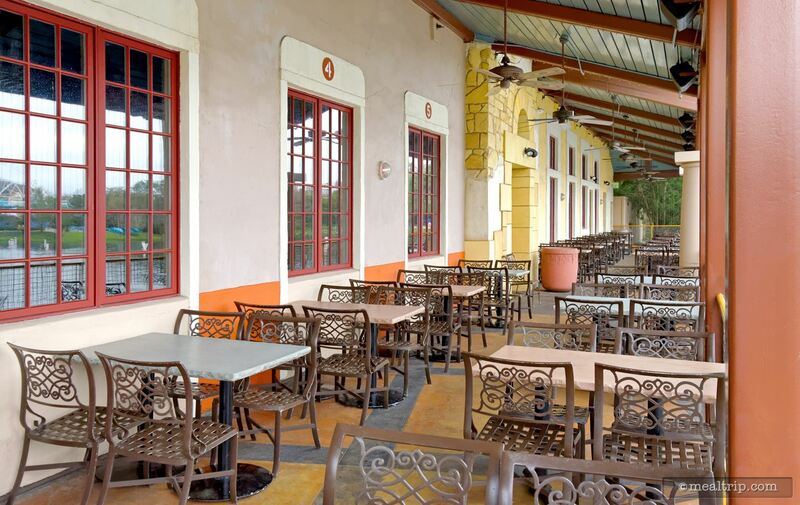 At all other times, only one register is open, and anything more than a few guests in line seems to bring the whole fast-food concept to a grinding halt. Anyhow, on my very first visit to the Spice Mill, I tried the cheeseburger. It wasn't the juicy big beefy patty that I like seeing in a burger, so I didn't have much hope for the location. 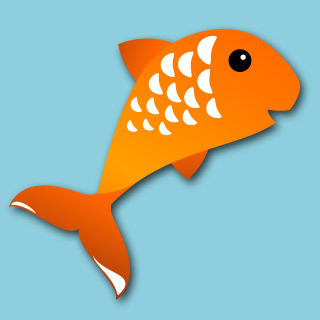 On subsequent visits, I've tried other things, and have been pleasantly surprised. 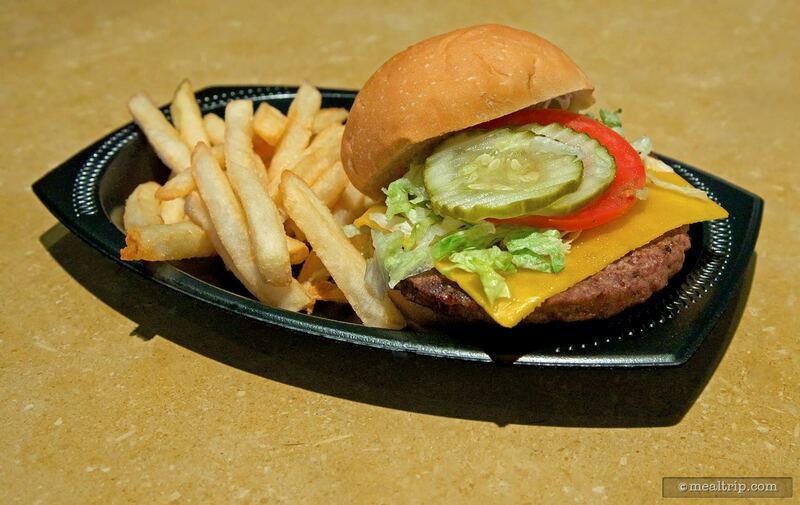 For a counter-service location the food here is pretty decent, (if you stay away from the cheeseburger). 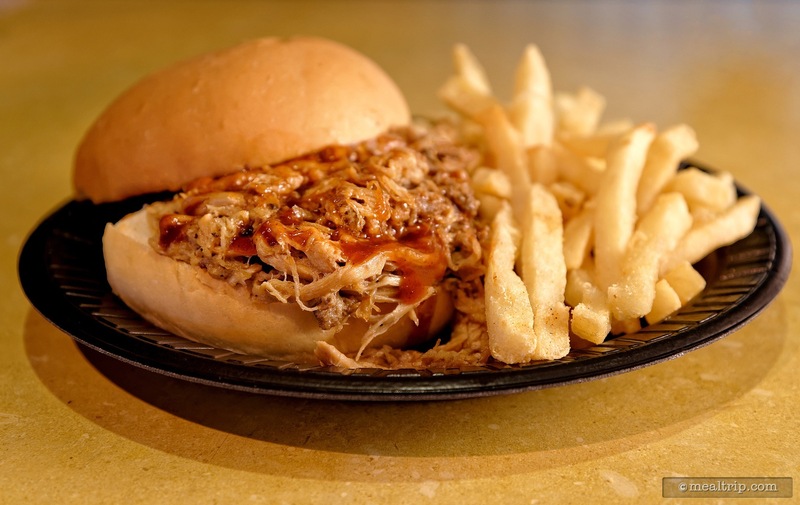 This time around, I selected the Pulled Pork Sandwich Platter. Don't expect too much from the word "platter" though, it's Spice Mill's way of saying there's a side of fries, and it's served on a plate. At $10.79 (2016) the sandwich itself is a good bit larger than anything you'll find at a Disney park, and from a taste standpoint, there's really nothing to complain about. 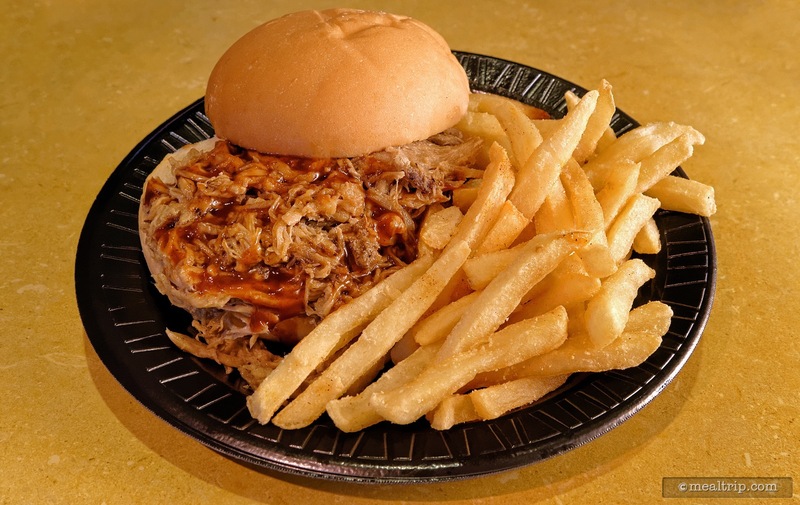 The menu does state that this is a Pulled Pork Sandwich and not a BBQ Pork Sandwich, so it's not intended to be a "real", slow cooked, pulled pork, bbq type of meat. 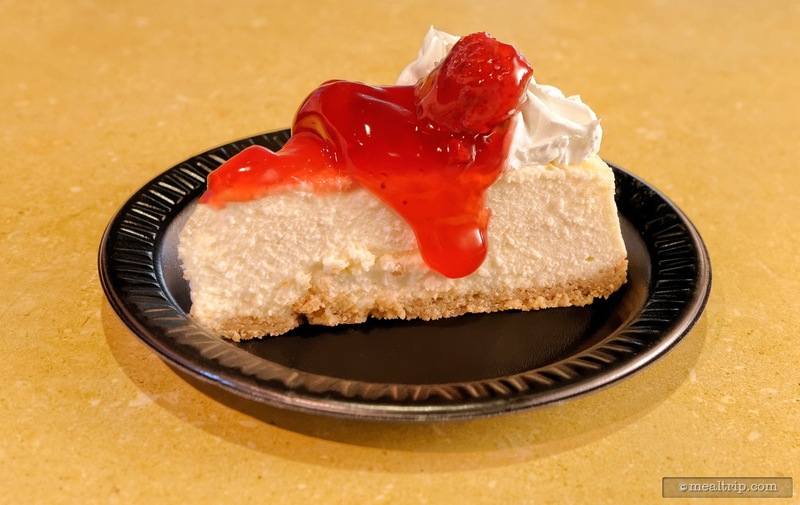 However, it's more of that… than some of the sauced-up variations that we've found at other parks. The Spice Mill sandwich was not slathered in sauce (although there was a bit on there), and I have to say... the pulled pork by itself was better than most of the counter-service level pulled pork that I've found on similar sandwiches. The sauce was a not-too-sweet (which seems to be the trend these days), but was a slightly smoky, slightly tangy, typical fast-food bbq sauce. The whole sandwich isn't breaking new culinary ground, but this is a counter-service location after all. What the Pulled Pork Sandwich does manage to do, is elevate itself above the Burgers at Spice Mill, (by at least a solid point), and is on par with the large Homemade Vegetable Chili in a bread bowl (which got high marks from me). The chili bowl was huge. The breadbowl was soft and fresh. Thankful the chili was saucy because the bread absorbed a lot which made delicious bread to eat with the chili. It was not too spicy and enjoyable just wish it was a smaller bowl. 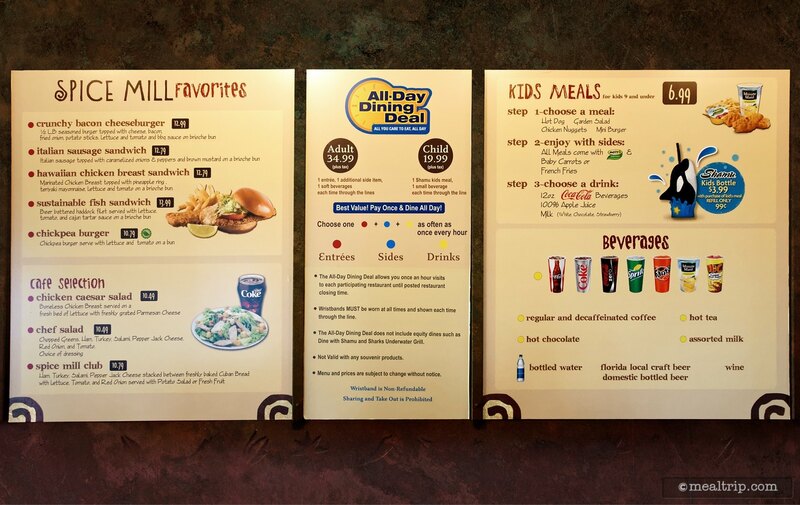 I have been interested about one menu item in particular at SeaWorld Orlando's Spice Mill, and that's mostly because it seems to be hidden when looking at the various menu boards around the restaurant. Maybe, because it's under the heading "A Healthy Alternative", my eyes skip right past it. 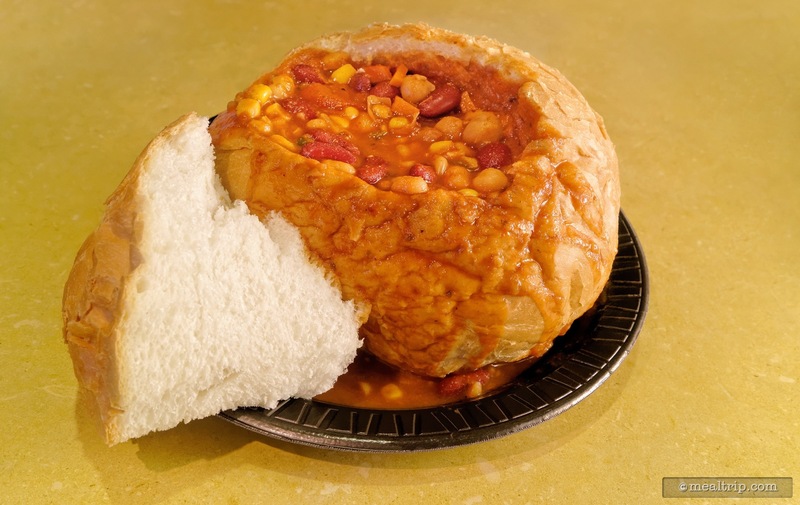 Which is too bad, because the "Homemade Low Fat Vegetable Chili" (served in a gigantic bread bowl) is a great entry! If you don't like beans, this chili isn't going to change your mind about that. However, if you like a good, mild chili that is actually a bit more like a bean heavy vegetable stew, you might be surprised at how good this one is. No, it's not spiced "hot", (or spiced that much at all really, just a bit of pepper, salt, and probably a pinch of garlic or onion powder). Most of the flavor comes from the tomato based broth and vegetables, of which, corn seems to be the most prominent (second to the various beans of course). The mixture stays warm in the fresh baked bread bowl... and that bread bowl is quite yummy as well. 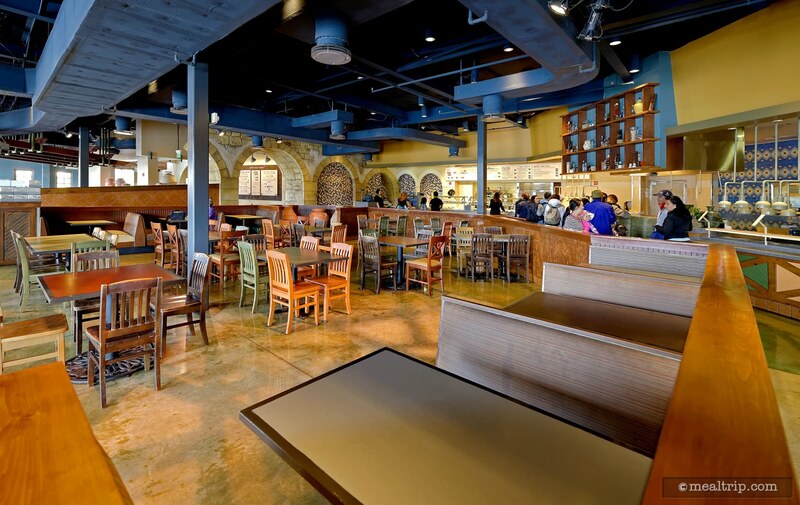 The bread bowl may be why the dish isn't featured more prominently on the menu boards… we have heard that they do occasionally run out of the yummy bowls, before they run out of Vegetable Chili. 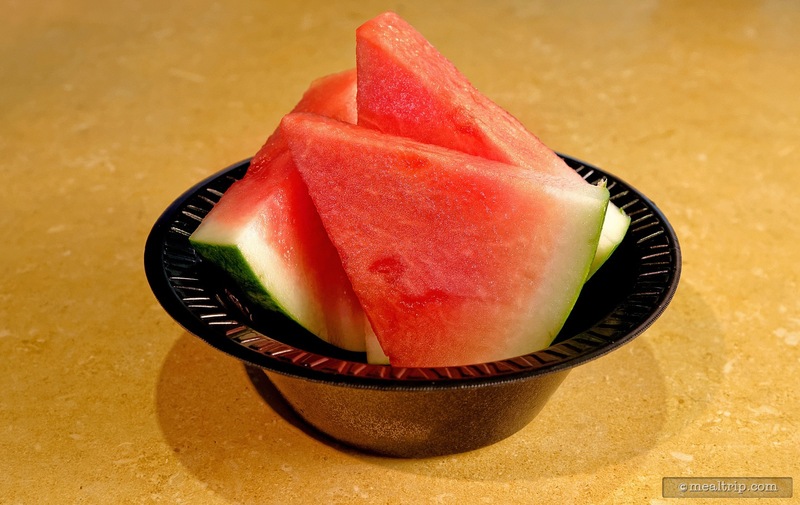 Once you see the size of the bowl, you'll understand why they can't stockpile a bunch of these beauties… they take up a lot of room on a bread rack. If you really want to try this dish, I wouldn't wait until late in the day, when they're more likely to run out of bread bowls. I'm not really sure how "healthful" the whole entree is. It's probably better for you than say, most of the other entrees served at the Spice Mill (which tend to be more of the fast-food variety). Eating an entire bread bowl the size of your head is probably going to add to your daily calorie and sodium count a lot more than just eating the chili alone. I however, am not watching what I eat, and the spectacle of the giant bread bowl adds to the fun of the dish! 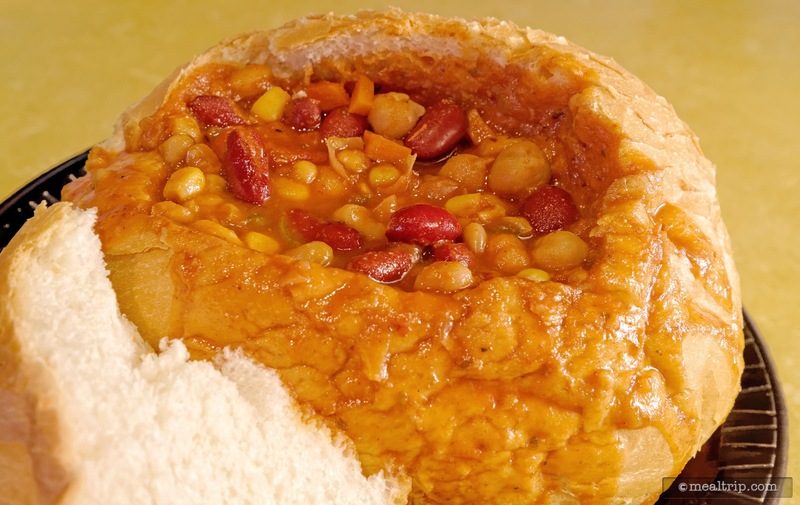 Prices fluctuate at theme park restaurants occasionally, but the the "Vegetable Chili in a Bread Bowl" has historically been one of the more reasonable dishes at the Spice Mill, which make it a great find, and definitely something a little different than what you can pick up at other fast-food based locations. Another quick tip… the Spice Mill does tend to get busy at peak times (i.e. "lunch" 11:30am-1:30pm)... and/or if a particular show has just let out and a ton of foot traffic passes by. 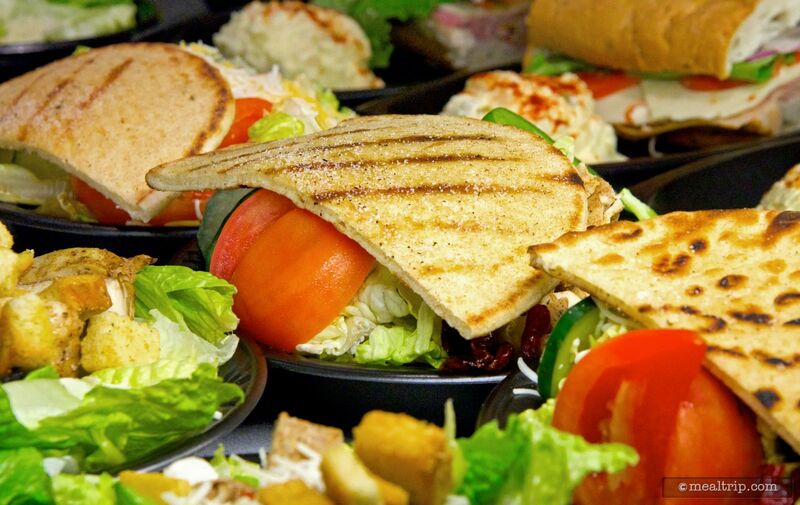 If both food pick-up lines are open, and chocked full of guests, you may want to wait a half hour, and try again. Locations with a "one food line feeding into one register" type of set up take more time to get through than "distributed register" set ups. 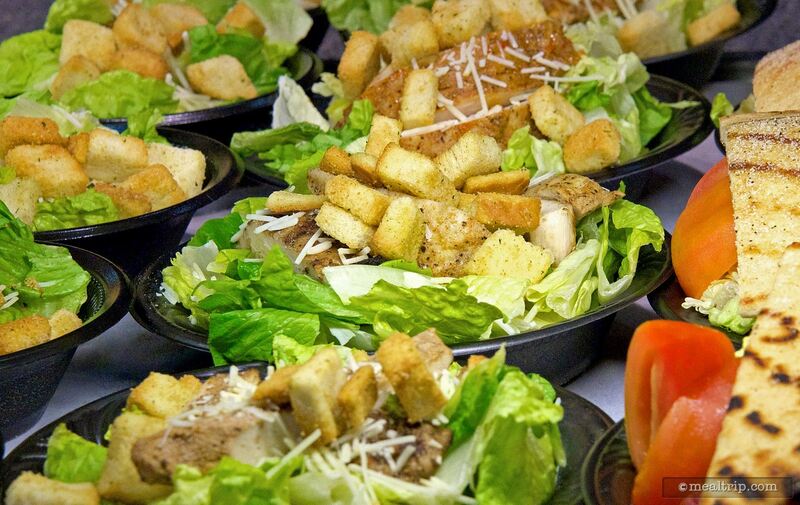 The chicken caesar salad was good. The chicken had a herb rub which I did not care for. Too heavy. The cheeseburger not good but the fries were great. 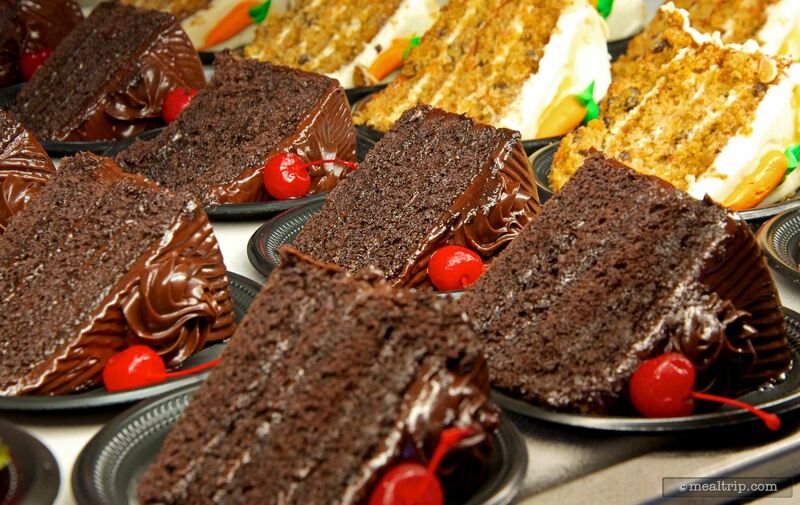 The chocolate cake you can find at all of the restaurants throughout the park is the best very moist and chocolatey.